Wow! What can I say? I’ve long wanted to get to grips with the balance between the commoner Chalk Fragrant-orchid and the scarcer Marsh or Dense-flowered Fragrant-orchid (above) at Ditchling Beacon. So I arranged to meet up with one of the commoners who just happens to be a leading specialist in orchids! Dr Phil Cribb and a local chap called Ben met me in the car park and we soon started counting orchids. We were not expecting them to be doing quite so well. With around 3250 counted in a couple of hours and this doesn’t even cover the whole site! They are bigger, darker, more densely-flowered and slightly later flowering. They are probably just peaking or going over as we speak so if you want to see this wildlife spectacle, then go and see them this week/weekend. You can smell them just by standing among them, they smell a bit like parma violets. This orchid is listed as RedList but Data Deficient. I wonder if this is the most significant colony in Sussex now? The bottom of the big slope at Ditchling is pretty hard to get to but this is where they are at their best. Hundreds growing in the holloway there that usually has none. It must be something to do with the crazy climatic conditions we have had over the last four months. And here is Phil with his magical counting finger. It’s really hard to see from this photo but this was perhaps the densest area of all. And here is possibly the main pollinator for this plant. Six-spot Burnet. Its proboscis is covered in the orchid’s sticky pollinia. 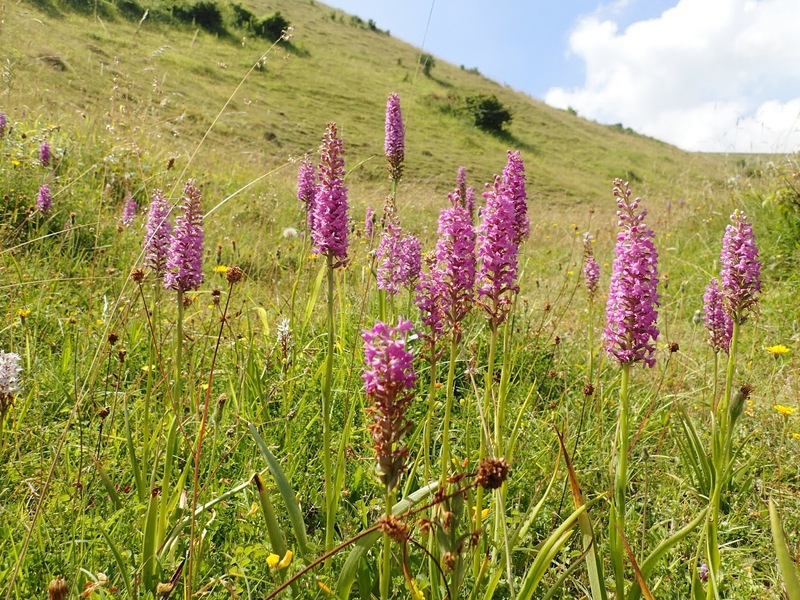 Here is a Marsh Fragrant-orchid on the left and the Chalk Fragrant-orchid on the right. We saw less than ten chalk! It wasn’t just these we were counting and mapping. We were also looking for Musk Orchids. They are not doing quite so well this year. We have counted 75 in the quarry or Tae’s Land this year already but only saw 18 today on the main slope. These are tiny, heavily designated orchids. Being Nationally Scarce, S41 and Red-Listed Vulnerable. I tried to get a decent photo of the two species together but this was the best I could do. Actually I think that’s a pretty cool photo, I can’t help feeling the Marsh Fragrant-orchid is looking down disapprovingly at it’s more diminutive and drab cousin. Saturday I am off to Heyshott to do the same thing. I wonder if they’re doing as well there too? Source: Graeme Lyons ‘A Density of Orchids’ The Lyons Den, 5 July 2018 https://analternativenaturalhistoryofsussex.blogspot.com/2018/07/a-density-of-orchids.html. With permission.